It’s tough, robust, stable, idealistic, and loyal to its principles. This is my conceived idea of the GNU/Linux distribution known as ‘Fedora’. That said, I don’t necessarily admire all of its characteristics, but I deal with Fedora with respect because I have a history with it. Because even though over the years I’ve used other distributions most of the time, I’ve never lost my love for ‘Fedora’, because whenever I use it, I just feel at home, put in my element. It’s quite confusing really 😛 . Anyhow, after being impressed by Fedora 21, for the past six months, it has been my main operating system and I have no intentions to replace it with anything other than Fedora (yet), and I eagerly waited for the Fedora 22’s arrival. Fedora is, though, notorious for delaying their releases, surprisingly, version ’22’ got released just after a week as had previously planned. 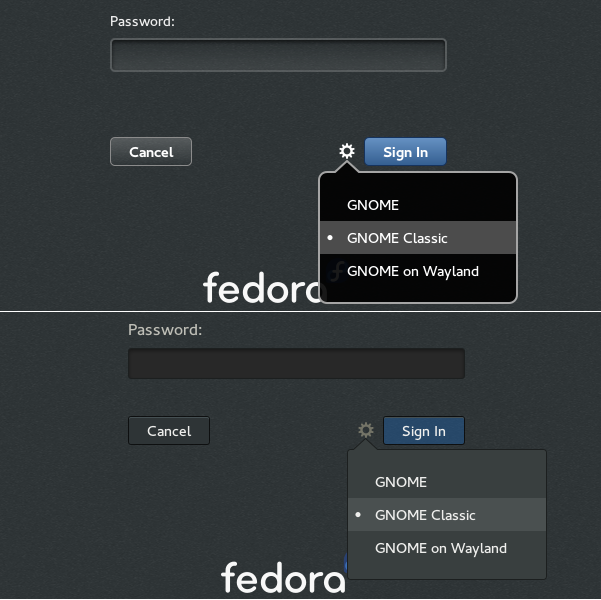 Since Fedora has always been associated & identified with the Gnome desktop and thus uses it by default, this review, just like the previous one, will be based on the Gnome3 desktop, with the ‘Classic’ version used by default, opposed to the GnomeShell (KDE , Xfce, LXDE and MATE versions are available for download as well). 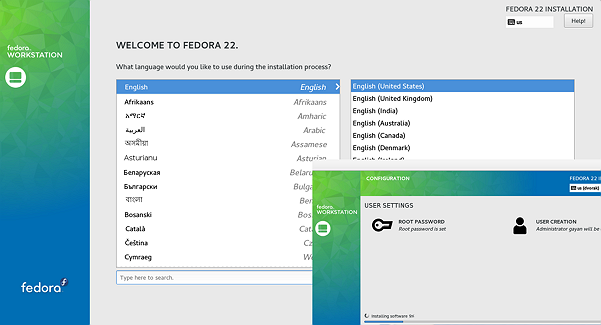 Fedora 22 includes two major changes. One is the Kernel version 4x (4.0.4) which now possess the ability to patch the Kernel with security updates without having to reboot the computer, something that the systems administrators will appreciate. The other major change is the Gnome 3.16.2 desktop. To put it into a simpler context, except for one or two ‘features’, I love this Gnome3 release. It’s visually more appealing, includes couple of new features and is very stable (more on those later). I’ve added performance related data into the review (though they’re presented at the end) and have used data from Fedora 21 for the comparison, and I took a great care when gathering these performance based data. For instance, after installing the system, couple of times, I boot into the OS, rebooted it, shut it down… for letting things to settle down. It was only after that I started to measure them, and except for turning off Bluetooth and enabling user auto login, I made no changes to the system to keep the accuracy level of these readings high. Written in ‘Python’, developed by RedHat, ‘Anaconda’ is an old installer. However starting with Fedora 18 it went through a major revamp and well took its time for ‘adjusting’. And except for a single issue, it was very stable. And the issue was, if you unmaximized it in Fedora 18 (19 included), then one would have to continuously scroll up & down for accessing its features because they get hidden due to the smaller window size. But the problem was, once you unmaixmize it, you cannot maximize it!. The developers worked around it in Fedora 21 by simply disabling the unmaximizing feature, and now in Fedora 22, you can maximize or unmaximize it freely. So, except for its fundamental design ‘error’, the issues seemed to have been fixed and it ran without any further issues. 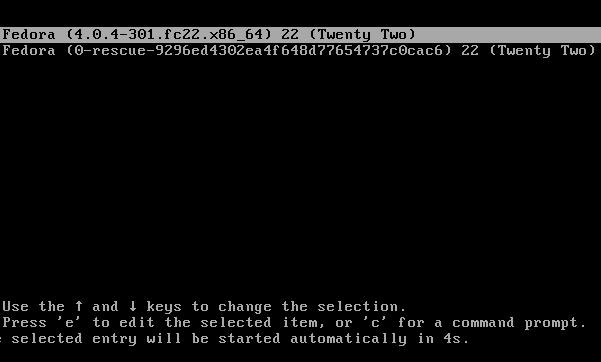 However, when I rebooted the computer, I noticed that there is no option in GRUB for accessing my main Fedora 21! (not cool ‘Anaconda’, you bad serpent you! 😀 ). I later fixed it manually, but it can be a big burden for new users. GRUB uses the default Black & White theme. And as you can see, an entry for Fedora 21 is missing. I had troubles while capturing the boot-logo, but since it was exactly the same as before, decided to ignore it, to hell with it! 😛 . There is no option in the installer to enable user auto login so the first time I boot the OS I was greeted with the login window. And the first thing that you notice is the flattish nature of the buttons and the menus. They used to be more round & puffy in the past, not anymore. And I love the new look (this of course is not confined to the login window, but is part of the refreshed Gnome 3.16 theme, thus is applied to other dialog boxes, buttons etc). When you login into the desktop, apart from the obvious new wallpaper, I noticed a couple of new changes. *. Firstly, in Fedora 21, the file manager gets opened up automatically when you log-in to the desktop. With this release, that feature has been removed (good!). *. The second one is the sheer size of the desktop icons, and they look ugly!. It’s like staring at the desktop of a 7 year old. Luckily this can easily be changed through ‘Preferences’ section of the file manager (under ‘Icon View Defaults’, simply change the ‘Default zoom level’ to ‘Small’ and you’re done). *. The next element is the quality of the font rendering. Previously they used to be a bit bold and slightly blurry (at least on my LED display), but it is very improved in this release as now they look sharp and clear. *. The desktop context (right-click) menu has received two new items, but in my opinion as a day to day desktop user, they’re both useless. First of all, the ‘Properties’ function doesn’t do anything on the desktop. Secondly, the ‘Select All’, though, it might have its uses, is still not terribly necessary. But the most annoying of it all is that the context menu which now looks humongous, because someone seems to have thought that displaying the keyboard shortcut assigned to each item is a useful feature. Seriously, come on!. *. Another change is associated with the application window icons. 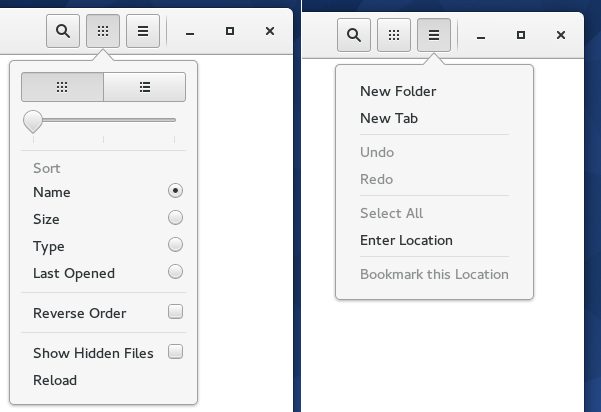 When you open an application, Gnome used to embed its icon into its menu at the top-panel. In GnomeShell the icons are still displayed but they are quite small and elegant. Sadly in in Gnome Classic, the icons are gone. But in a way it adds a sense of continuity to the top panel (with ‘Application’ & ‘Places’ menu and all). *. Notification area is also changed. previously on Gnome Classic desktop session, they were delivered at the middle bottom area of the screen. Now they’re shown on the right-side corner. The ones you’ve missed can be accessed through the ‘Date & Time’ area. A neat change. Talking of notifications, now whenever you try to ‘safely remove’ a storage device, if some data needs to be written to it, then unlike in the past where Gnome only gave users a notification when all was done, now it actually notifies and warns you that some data has to be written before it is safe to remove it. A very useful feature for dealing with impatient users, I must say 🙂 . *. However, the system tray area is now located at the left-side corner. I honestly don’t get Gnome developers. Wouldn’t it have been elegant had they too were shown around the ‘Date & Time’ area? *. On some applications (such as the file manager), when cursor is idle (not moving) the scroll-bars are hidden by default. If you move the cursor a bit then they’re slightly revealed, still too small of being useful. But when you move the cursor over the scroll-bar area, then you get the full wider version. Another nice addition. *. File operation boxes (file copying, compressing…) in file manager have also been improved. They look compact, neat & modern. *. When you send a file or a folder to ‘Trash’ a transparent pop-up box now appears in the file manager, letting you ‘Undo’ what you just did. Though it disappears after about 3 seconds, it can be a bit distracting at times. *. The file manager uses the same giant icons as on the desktop, but that can be fixed as mentioned earlier. But that ‘introduces’ another problem. When you set the default zoom level to ‘Small’, then the gap between files gets reduced and thus characters of folders (or files) even with shorter names get pushed down, making them funny looking & hard to read, as shown below. I like the new popovers that give access for changing the views, zooming levels, open a new tab etc. They both look much more organized and small opposed to their predecessors which were big & bulky. Very nice. There are many other changes in Gnome 3.16, but I’ll stop here since I’ve seen others expose them, and I’m sure you’re aware of them by now. However, now allow me to talk a bit about another major change in Fedora 22, although it might only interest power users such as system admins, not the average users. 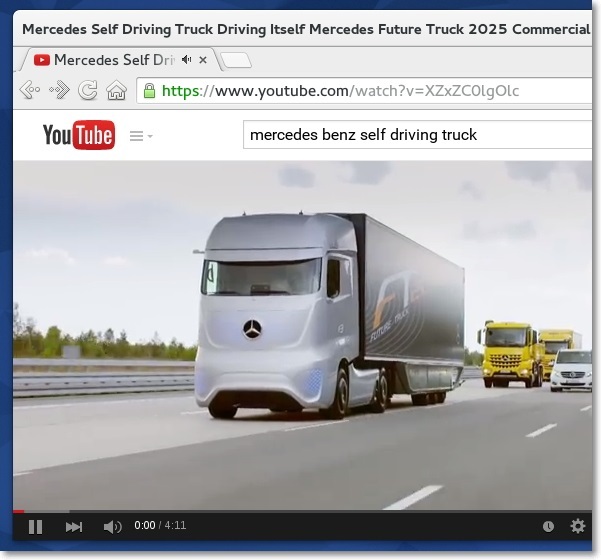 In Fedora 22, ‘yum’ (command-line package manager) is replaced by a new tool called ‘dnf’. 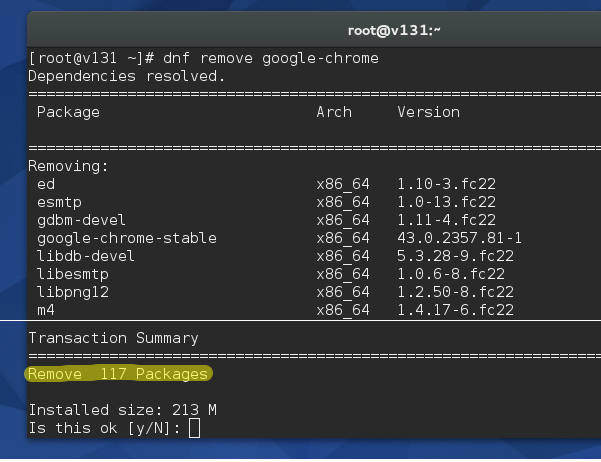 The main difference between ‘dnf’ and ‘yum’ is that, ‘dnf’ is exceptional at handling dependencies, while both installing and removing software packages. For instance; when you need to install a package that resides in your hard disk (or a ‘local’ package in other words) using ‘yum’, you have to add the ‘localinstall’ option so that it knows you’re trying to install a local package. It’ll then install it and resolve the dependencies (if any) automatically. But with ‘dnf’, you don’t have to specifically mention any of that. You can just type ‘dnf instal’ & add the path of the local ‘rpm’ file and ‘dnf’ will do the rest. It’s that simple. But that’s actually not the important or the impressive feature. Let’s say that you installed a package called ‘A’ using ‘yum’ and it also installed 15 additional packages as dependencies (packages that are required in order for ‘A’ to function properly), and then later, without adding or removing any packages, if you tried to remove ‘A’ then there’s no guarantee that ‘yum’ will remove all the dependencies that got installed with it. What usually happens is that ‘yum’ will only remove ‘A’ or if you’re lucky, it might remove 2-3 of those dependencies only. The thing about unused dependencies is that not only they consume disk space, but can reduce the system’s performance as well. But with ‘dnf’, I tried to install Google Chrome, then the next day when I tried to remove it, ‘dnf’ was able to remove all the dependencies that got installed with Google Chrome!. I mean, how cool is that? What a relief. That said, not everything is impressive with ‘dnf’ (yet). For example; when downloading packages, if I terminated ‘dnf’, and then re-entered the same command, then ‘dnf’ starts to download all the packages from the beginning. Where as in ‘yum’ it would’ve simply ignored all the packages that were already downloaded (before the interruption occurred) since they’re cached on disk, and starts to download the rest. So with ‘dnf’ this can be costly if you have a limited internet connection. Hopefully, it’ll be fixed in the future. Also concerning package management and keeping the system up-to date, ‘packagekit’ utility works in the background and downloads whenever updates are present in the main Fedora repositories. And when finished downloading, it not just notifies the user (which it also did in previous release), but now it even adds an option in the ‘Shutdown’ conformation dialog-box letting the user install the pending updates. 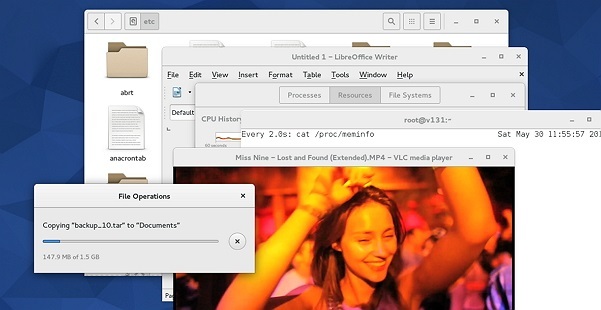 It’s actually another handy new features of Gnome 3.16. For other applications, among others, Fedora 22 includes Firefox 38.0.1, Shotwell 0.22.0, LibreOffice 4.4.3.2, Empathy 3.12.10, improved ‘Gnome Boxes’ (3.16.2) and Windows Media Player 12.0 (just kidding! 😀 ). Fedora does not include any proprietary codecs, but installing them is very easy. Just double click on a multimedia file and if the codecs are not installed, you’ll be asked whether you’d like to have them installed, it’s that easy. As per Flash playback, I installed Chrome as Adobe has abandoned the development of the Flash Player for Firefox. So far, the Flash playback is outstanding. Well, that’s pretty much all the features I wanted to expose to you. So I’ll now move on to talk a bit about performance aspect of the operating system. As mentioned in the beginning, please remember that prior to measuring these data, I enabled the auto user-login. As you can see, compared to its predecessor, Fedora 22 was very slow to boot (almost about 50% slow!). Of all the Fedora versions I’ve used recently, this was the slowest. So why is that? Well, I think I have a hunch and I’ll put it in a layman’s terms so anyone can get a basic understanding. Up to Fedora 21, there was a tool that significantly improved boot-up times by simply loading all the data required by boot-up services into the RAM before they’re demanded (a process known as ‘preloading‘). So when booting, when these services are executed, since all their dependencies are already found in RAM, they can be executed quickly. This in turn significantly improves the boot-up speed. This tool was called ‘systemd-readahead’ but very recently its development has been abandoned. But as you can see, poor buggers like me who still uses rotational hard disk drives pays the price for it, and it’s a dear one. Update: Actually, I did re-install Fedora 21, overwriting Fedora 22, and measured the boot-up times with & without ‘systemd-readahead…’. The boot-up times were pretty much the same 27-28 seconds with it enabled (default) as before, but as soon as I disabled ‘systemd-readahead…’, the boot-up times was set around 38.3 seconds!, or 39% slower (I took four samples), roughly. As you can see, the existence of ‘systemd-readahead…’ makes a big difference. But Fedora 22 is still 11% (3.1 seconds) slower and I can’t point out all the exact reasons, but my guess is that could be mostly due to an additional system service or two. 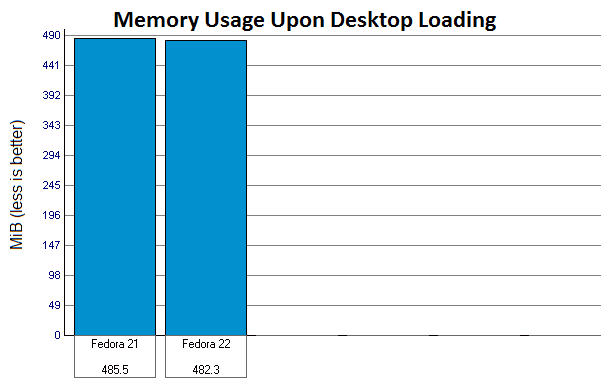 As you can see, memory usage between Fedora 21 & 22 is basically the same, with Fedora 22 using 0.7% less memory. Nice. 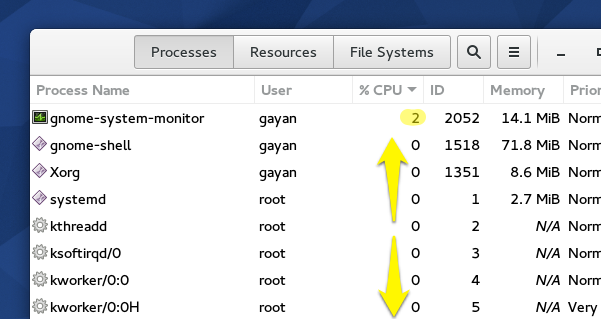 Except for the system monitor process itself, other processes’ interference with the CPU was minimal. Excellent. When measuring power I always disable screen turning OFF, dimming down … and keep the brightness at maximum level. Bluetooth is also turned OFF, but I keep Wi-Fi turned ON connected to my Router and then let the system be. 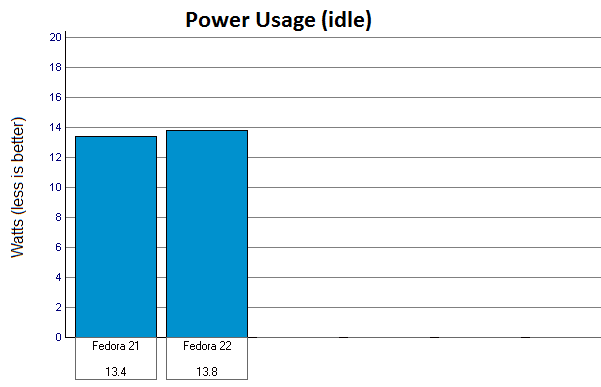 As you can see Fedora 22 used about 3% more power compared to Fedora 21. But then I installed ‘TLP’ (a power usage optimizer), and power usage level of Fedora 22 then dropped to 12.17 Watts (11.5% reduction). Fedora 21 after installing the same tool scored about 12.75 Watts. Fedora 22 recognized and configured almost all of my hardware. It remembers the previously set display brightness levels, the previous state of the Bluetooth adapter (whether it was turned ON or OFF), though sometimes it gets turned ON. GPU, Sound and other features like Suspension work like a charm. 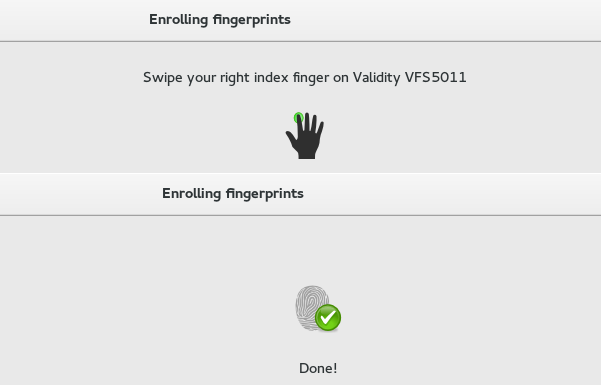 And Fedora 22 even recognized my ‘VFS 5011’ Validity fingerprint reader too!. But it doesn’t work properly yet. For instance, I can add a fingerprint to it, but can never use it for authorizing anything (it just fails to match the fingerprint). Hopefully as times goes on, a better driver will arrive. When it comes to system responsiveness, I’m only interested in the perspective of a desktop system, not a server environment. Thus I follow a simple practical approach, such that while copying a file (about 1.5GB) within the user’s ‘Home’ folder, I try to open a couple of programs (including the playback of a multimedia file) through the ‘Applications’ menu, if it’s Gnome3 then I also try to open one or two by searching in the ‘Activities Overview’ window as it helps to better evaluate the system’s responsiveness even better. So at the end, if the mouse sensitivity doesn’t get lost by that much, if the vast majority of the programs get opened before the file copying finishes & if the multimedia playback doesn’t get interrupted by that much, I consider it to be a good responsive operating system. Yes, it’s that simple. Thus, with the same intent, I carried out the same test in Fedora 22. So what was the result? It was excellent!. Most of the programs (System Monitor, LibreOffice Writer, Shotwell, Firefox, Terminal emulator, Document Viewer…) got opened up before file copying finished. The system got stuck for about 2-3 seconds and then came back (the mouse sensitivity got lost for that time-frame), and even when that happened, the audio playback of the video file carried out without any issues whatsoever, though its video playback suffered by a couple of frame skips not on that occasion only, but in a couple of other occasions (nothing major). I was also able to open ‘/etc/’ directory (it contains a reasonably large amount of files in it) with the file manager. What can I say, I loved it!. 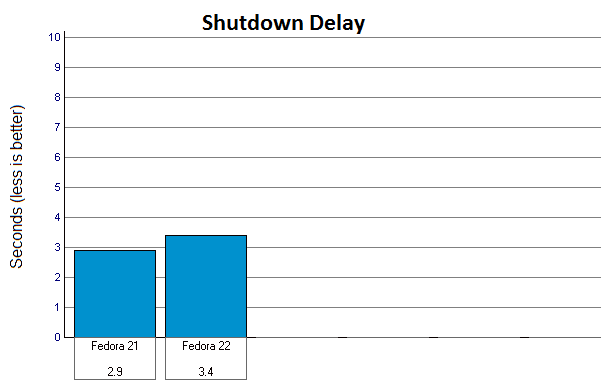 Fedora 21 shutdowns a bit faster (about 17.2%) than Fedora 22 but a shutdown time of 3.4 seconds is still pretty fast. 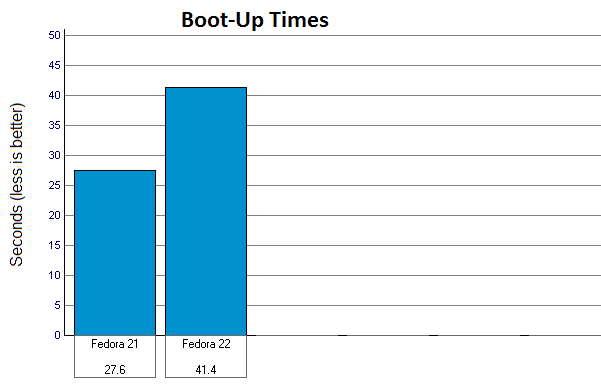 Fedora 22 is about 50% slow to boot compared to 21, and that’s a big gap. And that gap is not there by a mistake, for I’ve long observed the presence of a destructive element in Fedora, it’s called “ignorance”. And that’s all I’m going to say about it, period. But, as mentioned in the beginning of this article, if I’ve personally experienced a sense of toughness & stability as far as ‘Linux’ goes, then by far, so far, Fedora has outweighed all of its adversaries. It has never lost that identity. And the this release is no exception. Thus, I’ll be switching from Fedora 21 to Fedora 22 as my main distribution, because overall, as far as the end-users are concerned, things have been improved. What say you!? 😉 . You can download it from here, and thank you for reading. Ubuntu 15.04 (vs 14.10 vs 14.04 LTS) Review: Demands A Little ‘Spanking’, But Rocks Afterwards! How to Install ‘HandBrake’ 0.10.2 on Fedora 22? I really like your system responsiveness test. I don’t know why other reviewers don’t pay more attention to this crucial attribute. If you’re old enough to remember the BeOS, you know its designers made responsiveness a priority. They thought a robust system should be able to handle having multiple, processor-intensive tasks thrown its way, and I agree. I’d love to see a table with each of your reviews that ranks all of the distros you’ve examined by their responsiveness, best to worst. Understanding that it’s hard to boil it down to one number, perhaps you could assign them ‘grades’. Thanks and keep up the good work! Thank you Alexis. I didn’t know that about ‘BeOS’, they sound like sensible people to me 😀 . Thank you for your suggestion, I’ll think about it. Excellent review. Thanks for all the details and stats. That really stinks about the increased boot time. I suspect that’s not actually due to the elimination of readahead. I once tested it with Manjaro on my old Dell B130 laptop, and I found that enabling the now defunct systemd readahead system actually increased boot time by a few seconds on my old spinning drive. 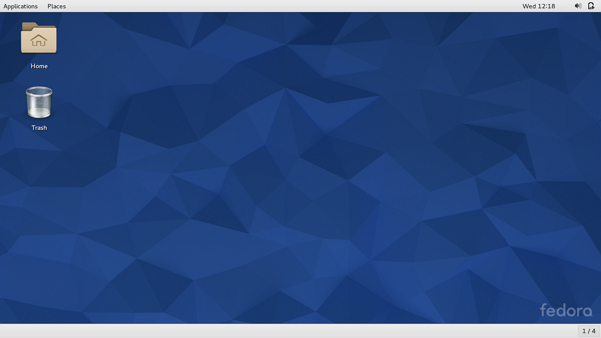 Do you still have a copy of Fedora 21 running anywhere? If so, it would be interesting to disable readahead on that system and then see how long it takes to boot. Thank you Sam. Like ‘mandog’ above (what a nice name 😛 ), your observation too could be right. I’ll try to re-install Fedora 21 on the same partition, just give me a couple of days please. P.S: Remember though, after enabling ‘…readahead’, it usually requires at least 2-3 booting instances, before it can work its magic, and thus, the first one or two times, the boot-up times can actually get increased while ‘…readahead’ gathers its data. P.P.S: Okay, I finally got a break and re-installed Fedora 21 on the same partition, and then measured the boot-up times with and without ‘systemd-readahead…’ and without it, Fedora 21 was 39%! slower. I updated the post with details (please refer to the ‘Boot-Up times Graph’ section). Nice review I think you are blaming readhead for something else that is causing slow boot times. Thank you for the suggestion ‘mandog’ ( 😀 ) and you could be right. However, the data is from Fedora 21 & Fedora 22, running on the same hardware & on the same partition of the hard disk drive. And this partition is the last partition on my hard disk & due to its location, the read/write speeds are not as fast as my main partition, which could be why it’s not as fast as your Arch system (there could be other additional services at work in Fedora that are not present in Arch, slowing things down as well). 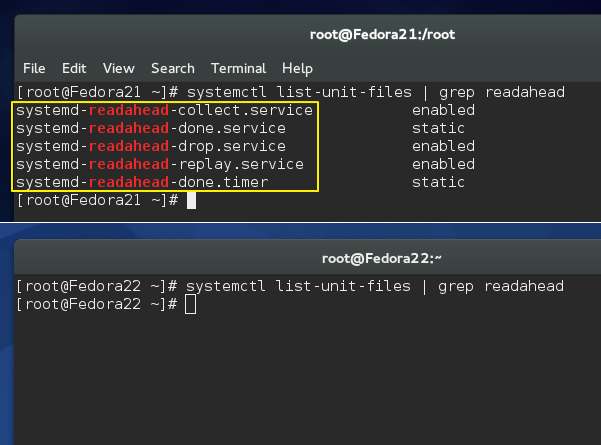 I forgot to test Fedora 21 without ‘…readahead’ because I didn’t know Fedora 22 didn’t have it (the Fedora 21 screenshot with ‘…readahead’ is actually from a Virtual Machine). Otherwise I surely would’ve done it. Still, in the past, in other distributions such as ‘Manjaro’ (https://www.hecticgeek.com/2013/09/improve-boot-up-manjaro-readahead/), after enabling ‘…readahead’ I’ve seen big improvements (not as much as 50% to be fair though). I’ve tested it in Ubuntu as well, and in Ubuntu if I remember correctly, boot-up speeds gets cuts down by around 35-40% with its own utility (‘ureadahead’) at work. Still, you could be right and this might be due to a different reason. But I’ll try to re-install Fedora 21 on the same partition and see how the boot-up times gets affected with & without ‘…readahead’. It’ll take me a couple of days though 🙂 . Thank you again. P.P.S: I just installed Fedora 21 in the same partition (overwriting Fedora 22) and measured the boot-up times with & without ‘systemd-readahead…’ and Fedora 21 was 39% slower to boot without it!. Please refer to the ‘Boot-Up Times Graph’ section for the update. until an alternative is found. Maybe there is a package for fedora as there is for other distros (Arch has one in AUR). How did you measure the power consumption? Because i was interested in a comparison with my PC. It’s very difficult comparing two desktop environments. Still, mainly due to ‘Compiz’, I find Gnome3 to be very stable compared to Unity. And when it comes to software selection, I think Ubuntu might have a slightly bigger repository, but there are couple of few repos for Fedora that contain a large number of both free & proprietary applications. Plus, even by default, Fedora does include a lot of software as well. P.S: Thank you for liking my review 🙂 . Great and Nice article dude. Added to favorites. Great article, but might I suggest using an SSD instead of a hard drive? I find my boot and shutdown times to be lightning fast compared to a platter based drive. Even a 256 GB SSD can be purchased for under $100 if you know where to look. Just saying, it would effectively eliminate your concerns about slower boot times overnight. I installed Fedora 22 just after it’s release. My experience was not good. Mainly touchpad was not giving a good experience. It was not able to scroll properly and I was not able to changes it’s default settings. Also responsiveness was not so good. Sorry to hear that 🙂 . Thank you very much. I was in a dilemma to upgrade Fedora 21 to 22. I liked the way you evaluated two versions of Fedora. Now, I am moving to Fedora 22.